With the wettest April on record coming just weeks after a drought was declared, it is not surprising the region’s farmers and food suppliers have been facing a nervous few months. For Robert Lockhart, an arable farmer near Tamworth, who grows cereals and potatoes, it had been touch and go up until the first proper rain for months started to fall. His prayers may have been answered for now and this year’s crop saved, but he and thousands of farmers like him still face uncertainty over water supply in the long term. “Our position up to April was extremely dry,” he said. “And noticing the effects of the drought on cereal crops, they would have been in a serious condition, if not dying, if we had not had the rain. “But now the rain showers are slowing up potato planting. March was very dry and warm but it has now gone cold and things planted in the ground are not coming up as fast as they should have been. Mr Lockhart was critical of the Government’s response to the water supply crisis. “The Government makes all the right noises, but the new rules and regulations mean if I was to build a reservoir now I could only build it half the size I did before,” he said. “It is all about making money, it is not about ensuring the national water supply. If I build a reservoir, which would cost several hundred thousand pounds, I could previously claim it off tax. “There is no joined up thinking there. I think we are in a financial crisis and they need every penny they can get – but it does not help if you want to make a long term investment. Last month’s deluge lifted the Midlands out of drought in early May, but experts have now warned that another prolonged dry period could mean another drought – and more bad news for agriculture. April’s rainfall has not been able to soak through dry, compacted soil, leaving groundwater supplies in the Midlands extremely low. Tim Jones, who farms sheep and cattle near Tenbury in Worcestershire, said merely finding enough grass for his animals was proving a real challenge. “We could do with it warming up a bit and it undoubtedly will,” he said. “All our water comes from a spring but that failed on April 6 last year and only came back on December 22. Despite the shortage of groundwater, the April downpours have “significantly increased river and reservoir levels”, according to the Environment Agency. 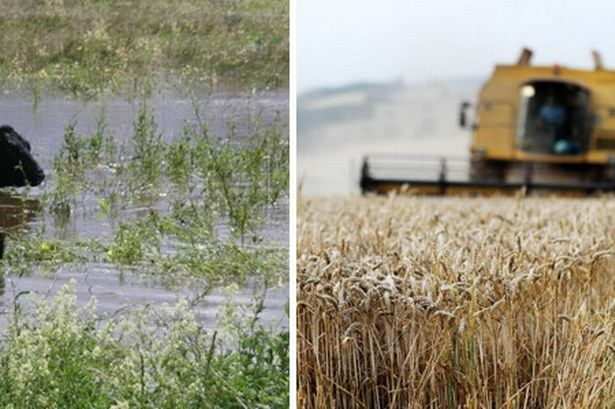 Dr Paul Leinster, Environment Agency chief executive, said: “The recent record rainfall has eased pressure on water resources in some parts of England, helping levels in rivers and reservoirs to recover and providing relief to farmers, gardeners and wildlife. But the National Farmers Union has said West Midlands water resources are still under pressure despite the recent rain. John Mercer, NFU regional director, said: “While we have had extremes, farmers are resilient and are used to managing and adapting to changes in weather patterns. “Crops should be well established by now and should there be more rain fruit crops will be under plastic protected by polytunnels and grass growth will benefit livestock later in the season. But some damage has already been done and in Birmingham the UK’s biggest wholesale market has seen less local produce as a result of the extreme weather. Mark Tate, chairman of the Birmingham Wholesale Fresh Produce Association, said: “All the English produce has gone short and backwards. "There is not a lot at the moment in English strawberries and cauliflower. Local strawberries have been delayed because of the cold weather and it has affected the vegetables a little bit. “Most food from this time of year has come from Spain and Holland – they’re having a freak hot weather peak at the moment. The Environment Agency announced the Midlands had entered a drought on April 16 following the driest 18-month period on record. In addition, the region had only received 40 per cent of the long-term average (LTA) rainfall in March 2012 and also experienced exceptionally low groundwater levels and river flows. A spokesman for the agency said: “When we announced drought we were seeing immediate environmental impacts. “We believed that six months of average rainfall would be needed to stave off the environmental impacts of low groundwater levels. DEFRA – the Department for Environment, Food and Rural Affairs – has issued new designations for drought. For an area to be in drought, there must be environmental stress – effects on wildlife, rivers and farmers – as well as water company restrictions on households and business. Then in April the Midlands received 250 per cent of long term average rainfall for the month and some areas saw more than three times the amount of normal rainfall – making it the second wettest April on record in the Midlands since records began in 1910. In the first eight days of May, there has already been 42 per cent of LTA rainfall in the Severn Basin and 27 per cent in the Trent Basin, which brought all the region’s rivers to normal levels with several to exceptionally high levels. An Environment Agency spokesman added: “The record amount of rain and cool weather, has meant we are not seeing environmental impacts we had expected.